Fort Delimara is in danger of collapse as the cliffs beneath it are eroding at a fast rate. Photo: Chris Sant Fournier. Fort Delimara, which has protected Malta's shores for over a century, is in danger of collapse unless urgent action is taken to save the structure. 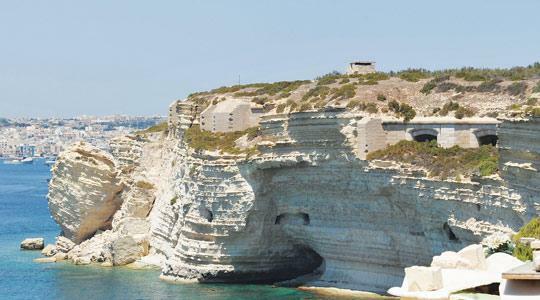 A spokesman for the Malta Environment and Planning Authority (Mepa) confirmed that the fort was eroding and that the weight of the tower posed a threat to the heritage site in addition to the pounding waves. No planning applications have ever been submitted to remedy the situation. Fisherman Ray Bugeja expressed concern in a letter to The Sunday Times in which he called for something to be done to stop the damage. Mr Bugeja, who is the secretary of the National Fishing Cooperative, explained that the rock was wearing away at a faster rate since the Freeport Terminal's breakwater was built in the 1980s. The breakwater altered the natural water path sending a "sea wall crashing beneath Fort Delimara". This created new problems in the nearby Marsaxlokk bay that houses the island's main fishing fleet. "The most sensible way to tackle the problem is to build a wave-breaking system that would eliminate the threats," Mr Bugeja said. Fort Delimara was built by the British between 1876 and 1888 and was one of a ring of forts and batteries protecting Marsaxlokk harbour. After being used as a pig farm for about 15 years, in 2005 the government handed the fort over to Heritage Malta - the national agency for heritage. A management committee was set up to assess the damage to the fort and propose solutions to restore it. But a Mepa spokesman said the committee had not met in about three years. Heritage Malta CEO Lucio Mule Stagno, who assumed the post two yeras ago, said: "The intentions were good but the plans fizzled into nothing." Heritage Malta had proposed a public-private partnership to restore the fort but the project never took off because of lack of funds. According to the plans, the fort was to be turned into a tourist attraction. The national agency for heritage is responsible for around 40 sites, apart from others on publicly-owned sites. The funds required to safeguard them all runs into tens of millions of euros. Fondazzjoni Wirt Artna (FWA) director general Mario Farrugia criticised the government's lack of action to safeguard the fort that houses the world's last remaining four 38-ton guns mounted on dwarf carriages. "FWA had been lobbying the government to take over the fort for about 20 years. Then Heritage Malta took it over. As usual nothing happened. There is no sense of urgency in this country. No wonder our national heritage is disappearing so fast," he said. Geologist Peter Gatt explained that the rock making up the Delimara peninsula consists of chalk cliffs which are eroded rapidly by the sea, especially at their base. This has already led to the collapse of large slabs. Speaking about the cause of the erosion he said that it was likely that the construction of the power station, some 400 metres away from the fort, had an impact. "The coast at the power station has been covered with concrete so waves accelerate along the coast, resulting in greater erosion under the fort," he said.